La Mexicana's Wood Chocolate Stirrer is the perfect tool for the chocolate lover. 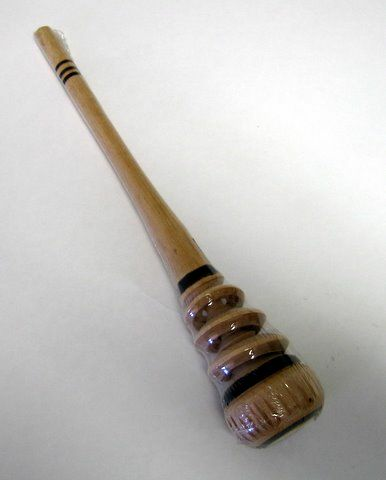 Commonly known as "Molinillo" in Mexico it is used to stir and froth warm drinks such as the popular Mexican hot chocolate, champurrado and atole. This unique tool was actually invented by Spanish colonists in Mexico aftering falling in love with the rich flavor of chocolate. These wooden stirrers are rotated between two hands in a twisting motion in order to give chocolate a rich and foamy consistency. Try it and you'll fall in love with Mexico's hot chocolate just as the Spanish did in the 1700s. Grab a pack of Ibarra or Abuelita chocolate tablets and stir away with La Mexicana's wooden whisk in order to prepare this sweet concoction that is loved by all generations. El Molinillo de madera de La Mexicana es la herramienta perfecta para los amantes del chocolate. Este utensilio es usado para revolver bebidas calientes y darles una consistencia espumosa como el popular chocolate caliente, champurrado y atole. Este utensilio fue inventado por los espanoles despues de enamorarse del delicioso sabor del chocolate. El Molinillo se debe rotar entre dos manos en un movimiento de torsion a fin de darle un rica consistencia espumosa al chocolate. Prueblo y te enamoraas del chocolate caliente Mexicano asi como lo hicieron los espanoles. Agarra un paquete de las tabletas del Chocolate Ibarra o Abuelita y mezclalo con el Molinillo de La Mexicana para preperar esta dulce bebida que es amada por todas las generaciones. Arrived quickly and promptly. It did not arrive shrink wrapped like the photo, but still in good condition. Makes the best hot chocolate! I ordered several molonillos (Mexican chocolate stirrers) as part of my Christmas Gift Baskets ... with Ibarra chocolate discs, themed mugs and How-To recipes on using the wooden tool to prepare Mexican Hot Chocolate. I checked many web sites and found MexGrocer had BEST PRICES styles and size molonillos I wanted for my gifts. Also, MexGrocer enclosed an extra, larger and fancier model carved molonillo as a bonus; which I appreciated. This is a good modest price for a hand-carved traditional kitchen tool. This tool PLUS authentic Ibarra chocolate tablets I also ordered from MexGrocer are well worth it. ProsGood price for the "medium" sized hand-carved molonillo, and I did comparison shop. Good proactive customer service, in enclosing a larger version "extra" molonillo to compensate one pre-packaged defective tool. More than balanced out. ConsTook far longer than 5 days for shipping between West and East coasts ... at least for shipping by FedEx or UPS. Would have preferred to select option of US Postal Service, which does a better delivery job than either FedEx or UPS. HOWEVER, even tho it took almost 14 days to ship, this order was placed only 10 days before Christmas day and busiest shipping season. Which explains delay. I have always wondered about this product and if it would make a difference in my mexican chocolate. It Did!! I loved my chocolate even more. It is also a pretty addition to my utensils I keep on the counter. I would recomend this to anyone who enjoys making Mexican Chocolate.